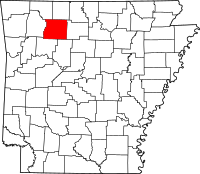 Newton County is a county of the U.S. state of Arkansas. As of the 2010 census, the population was 8,330. The county seat is Jasper. It was founded on December 14, 1842. ↑ "State & County QuickFacts". United States Census Bureau. Archived from the original on July 15, 2011. Retrieved May 23, 2014. This page was last changed on 8 March 2019, at 07:45.